Once, years and years ago, I was out to dinner with my two oldest kids. This is way before I had the two youngest. Our waitress came and the end of our meal to tell us our dinner had been paid for, by a gentleman who made a habit of coming to that restaurant and picking a new family to pay for each time. On that day, he picked us! It was a nice feeling, but also kind of embarrassing. I wondered if I somehow looked in need. I was grateful it wasn’t a big bill or it would have made me more uncomfortable to have a stranger pay for us. 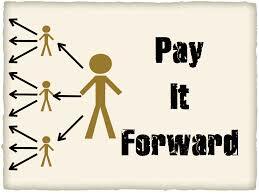 I really didn’t get the concept of paying it forward. I never considered that it probably made that man feel good to do it for us. I never considered turning around and doing the same thing for another family. I hear from a friend about how she had started paying for the person behind her in line at fast food places, Starbucks and the like. I thought it was a great idea, and started to do the same. I was told once that the longest line of “paying it forward” at a particular Starbucks was 6 customers…6 people who not only appreciated a kind gesture, but took the next step to keep it going. Something that went right over my head years ago for some reason. I like the feeling I have as I drive away, and I like that I remain anonymous to these people. It’s not about being thanked, or needing the recognition from someone you choose to be kind to. I like how I’ve heard it described by the person who inspired me to think more of others. It’s more about sharing positive feelings, letting them out there and hoping they keep flowing. Small things, cups of coffee, a box of diapers on the doorstep of that family with the new baby, even an extra big tip for your waiter/waitress. This entry was posted in life, positivity and tagged acts of kindness, gratitude, human kindness, positivity. Bookmark the permalink.